Q: Is being a good front-runner or closer something that you feel is maybe a deficient area in your game? Harrison: You could have used a little better word choice there. It’s not very nice to call somebody deficient. Q: An area of improvement? Harrison: There you go. That would have been nicer. Harrison was out, but Simon was back Wednesday to face another American, Brian Baker. You have no reason to know who Brian Baker is unless you were intently following tennis news seven years ago, or over the past week. In brief, Baker was once a top American prospect (how many times have we heard that phrase? ), then the following happened, in order: a wrist injury, a torn MCL, hip surgery, sports hernia surgery, Tommy John surgery, and, for good measure, hip surgery again. Baker was out of tennis for about six years, before he began playing last year in regional tournaments — a NASCAR driver on the soap box circuit — then Challenger events (roughly, the Truck Series), and finally events nearer the top. He qualified for the French Open, and brought an entourage: mom, dad, girlfriend, sister, aunt, uncle, all of whom arrived hours early for his first-round match to secure good spots on an outer court, where there were no reserved seats for family and friends. His uncle got so hungry waiting around that he ate a candy bar someone had left on the ground. At least one American reporter has suggested pooling funds to buy film rights to The Brian Baker Story. If Baker is living some version of an American dream it seems reasonable to offer a simplified cultural comparison. Where Simon is lithe, almost waifish (i.e., French) Baker is tall and muscular (i.e., American). He walks with a halting gait, as if he had once captained a high school math team, and has a high forehead and bulky haircut that — don’t kill me, Brian — make him look like a more wholesome Beavis, with an All-American rather than lecherous smile. 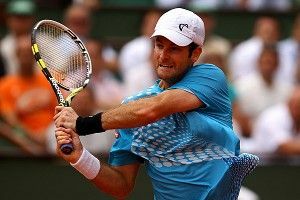 Simon’s ground strokes are full and lovely to watch: His forehand loops, his backhand swings uniformly like a pendulum. Baker’s are short and jerky, in the style of most American players since Roddick. For the first two sets, they were also largely ineffective. He lost both, and all the American reporters left. Kill the script. Everyone else in the stadium mostly stopped paying attention, especially the young French couple in front of me, en amour. I was e-mailing today with an American soldier based in Paris regarding my quick assessment that French people, by and large, don’t care much about sports. He replied: “Concur absolutely — [Paris] is not a sports town and it’s not a sports nation. It’s all about politics and national issues, from what it seems. Hell, my coworker could hardly bring herself into work the day after Sarkozy wasn’t re-elected, she was that distraught. We talked about it for 30 minutes, and I didn’t do a lot of conversational lifting, if you know what I mean.” Better for the fate of the Republic, perhaps, but not for a riveting atmosphere. Americans are distracted at sporting events by dance shows and JumboTron games; French spectators are simply distracted by each other. Amid all this, Baker came back. He won the third set in a tiebreak, and the fourth in half the time. His jerky forehand became a weapon, and so did something decidedly un-American: Baker had 14 gentle drop shot winners on the match. That’s a remarkable number — Simon had just one — and it prompted a journalist with a hearing aide and a Borsalino hat to tap me on the shoulder and whisper, “I have not seen this since Sampras.” He thought for a moment, then reconsidered, “No, no, since McEnroe.” The American reporters returned to the stands. As Simon earned an early break point, even the crowd turned its eyes back to the court, save for the couple, who this time chose not to wait for a pause and started making out during the point. Simon lost that one, but he won most of the others. Baker didn’t win a game in the fifth set, and his loss would cap a lousy streak for the Americans. Thirteen have taken the court since Tuesday, and only one of them had won. That winner, Sloane Stephens, went on to face Bethanie Mattek-Sands, another American. By Wednesday, there were only four left in both draws. Allez, everybody else!